TS PGEC/TS PGECET 2019 Web options,Certificates verification dates: TS PGEC/TS PGECET-2019 Web Based Counseling Dates for ME/ MTech/ MPharm / MArch/ Graduate level Pharm D Admissions : PGECET is Telangana State Level Common Entrance Test for admission into Regular PG Courses in Engineering, Technology, Architecture, Pharmacy (ME / M.Tech./ M.Pharmacy / M.Arch ), Graduate level Pharm-D (Post Baccalaureate) for the academic year 2019-2020 conducted by University College of Engineering, Osmania University on behalf of Telangana State Council of Higher Education (TSCHE), a statutory Body of the Government of Telangana., Hyderabad. 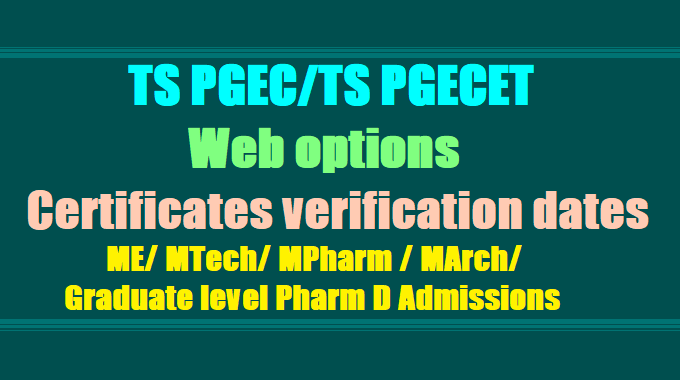 schedule for Exercising web options-Certificates verification: All the eligible and qualified candidates of GATE/GPAT 2019 & 2020 and TSPGECET-2019 are hereby informed that Certificates verification for admission into M.E. / M.Tech. / M.Pharm. / M.Arch. courses /Pharma.D(P.B) courses for the academic year 2019-2020 will commence as per given dates. Exercising of web options will commence as per given dates. The date of seat allotment will be notified subsequently. The details of list of Colleges and Specializations along with Fee structure and procedure for exercising web options will be made available in the websites www.tspgecet.tsche.ac.in and http://pgecetadm.tsche.ac.in/. Students are advised to go through the instructions in the website and exercise the web options carefully. 1. The GATE qualified and eligible candidates of 2017, 2018 and 2019, GPAT and TS PGECET qualified andeligible candidates of 2019 are informed to attend TS PGEC / TS PGECET Web Based Counseling for admission to M.E./ M.Tech./ M.Arch / M.Pharmacy/Pharm.D (P.B.) courses for the academic year 2019-2020 as per the schedule given below at any one of the Help Line Centers. 2. Candidates are informed that they should satisfy the admission rules prescribed in the related G.O. prepared to pay the tuition fee as applicable. 4. This notification itself is a call for web counseling. No separate call letters are sent to the individual candidates. 5. Mere attending of the web counseling does not guarantee a seat. 6. Candidates have to pay non-refundable processing fee of Rs.600/- for SC/ST candidates and Rs.1200/-for others at the time of certificate verification. Fee to be paid: Tuition fee particulars and seats available under Convener Quota, college wise, will be made available in the website http://pgecet.tsche.ac.in or http://pgecetadm.tsche.ac.in well before the commencement of option entry. The fee reimbursement for eligible candidates is subject to the guidelines issued by the Government from time to time. Serving persons have to produce Service Certificate from the place of Work indicating the relationship with the Candidate. Candidates whose parents are domiciled in the State of Telangana based on the Permanent Address / Home Town declared by them while joining the service and as recorded in the their Service Register are alone eligible to be considered under “CAP” Category”. 2 University P. G. College Secunderabad. 3 Nizam College Basheer Bagh, Hyderabad. 5 Residence certificate for preceding 7 years of the qualifying examination i.e. Graduation in respect of candidates who have private study without any institutionalized education. 6 Integrated community certificate issued by the competent authority in case of BC/SC/ST candidates. 7 Residence certificate from M. R. O of either of parents in Telangana for 10 years in case of non-local candidates. 1. Candidates are required to be present on the notified date and time at the helpline center as per the schedule with all the relevant certificates and fee. 2. Candidates are called for registration rank-wise. The candidates are required to sign in the register and pay the processing fee and proceed for verification of certificates. Candidates belonging to SC / ST category have to pay Rs. 600/- and all others have to pay Rs.1200/- towards processing fee which is non-refundable. 4. Tuition fee reimbursement will be as per the rules of Telangana State government. Income certificate issued by MRO after 01-01-2019 will only be considered. 5. The candidates shall produce Original certificates as notified at the time of certificate verification and bring Photo copies of certificates for submission. 9. Candidates need to verify the mobile number, caste category, local area, gender, minority, parental income, special category, date of birth, eligible degree, specialization and details of other TSPGECET examinations printed on receipt of certificates. Any discrepancy should be brought to the notice of Camp Officer / Co-ordinator immediately for corrections. Seat allotment process depends on the accuracy of the above data. You are also jointly responsible for ensuring the correctness of the data. 10. Candidate can give options on the web either from helpline centre / home / any other place having internet facility. To exercise web-options candidates has to login with Hall-ticket number and Rank. A five digit PIN will be sent to the registered mobile number. Don’t share the PIN with other. 11. The detailed instructions for entering options on web are available at http://pgecetadm.tsche.ac.in. 12. On the notified date, the web options are processed and allotment is communicated to the candidate through SMS. 15. Candidates are instructed to be careful while exercising options on the web and take the print out of the Saved options. 17. Refer Procedure to Exercise options for instructions to the candidates for exercising options on web. 18. Candidates are informed to check their final allotment, take printout of allotment letter from the web, and report to the respective colleges on or before the date furnished on the allotment letter, failing which the candidate will lose the seat and his / her admission stands cancelled. 19. Next round of counselling for left over seats in phase-I and not reported cases and new seats sanctioned, if any, will be conducted. A separate notification will be issued for the left over seats and new seats, if any, sanctioned. 20. Who should participate in Phase-II? c. Candidates who did not participate in earlier phase even though he / she has been called for counselling. d. Candidates who were allotted a seat but didn’t report. b. Candidates have to exercise options afresh for each phase of web based counselling. c. In case if they are satisfied with the previous allotment, options need not be exercised again. 22. If the candidate secures a seat in phase-II, he / she will lose the claim on the earlier allotted college, and has to report to the new college by downloading the allotment letter on or before the date furnished in the allotment letter. Failing to report within the date furnished in the allotted college, the candidate will forfeit the claim on the new college as well as on the old college. 23. After the Second Phase of admission, in case the candidates wish to cancel their admission, they are required to approach the principal of the college concerned only. 24. The left over seats after allotment for GATE / GPAT Candidates are alone available for TSPGECET-2019 candidates. 6. Candidate has to get the certificates verified at Help Line Centre before he/she can start exercising options. 7. Candidates are required to login to receive the PIN to the registered Mobile number. 8. Exercise web options as per the given schedule. 9. candidates are advised to take utmost care while giving web options as the allotments will be made in the order of preference given.